Point your browser at this and you can read some preamble to our first forage into the realm of sporting art. Lyn Gardner’s writ some stuff here. The jury’s still out as to whether she was including herself in with those people who think our endeavours are ‘a bit of silliness’, but being charitable people we’ll give her the benefit of the doubt and not be little sulkers. No link this time, unless you count clicking on the little picture below. Unfortunately we have no transcripts, pod casts, or streaming radio for you, but if you can take our word on the matter, we did have an interview with the World Service, and a very nice man came down to give updates back to the studio throughout the afternoon of the 26th May. So 159 million people heard about the cuts to the Arts Council, and more importantly, 159 million people heard about us. To this day, there’s probably people in Papua New Guinea kicking themselves for not making it down to Hackney Marshes. A very nice film crew from Optimistic Productions came down as well. They filmed stuff, interviewed people and the cameraman even got hit by a hurled handbag. Quite what they’re going to do with the documentary footage they gathered is uncertain, but if nothing else, it may be discovered by future archaeologists and held up as evidence of turn of the century pastimes. Moving on to the second of our days of sport, and we have the below from Timeout. 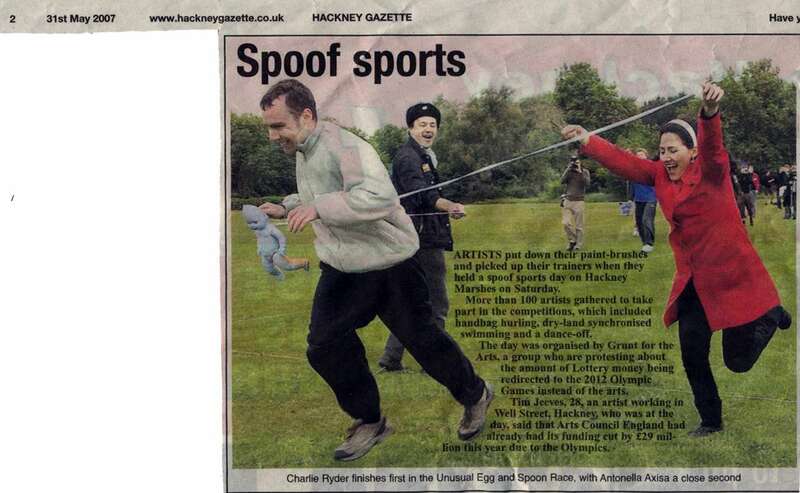 With London 2012 came some further press appearances. 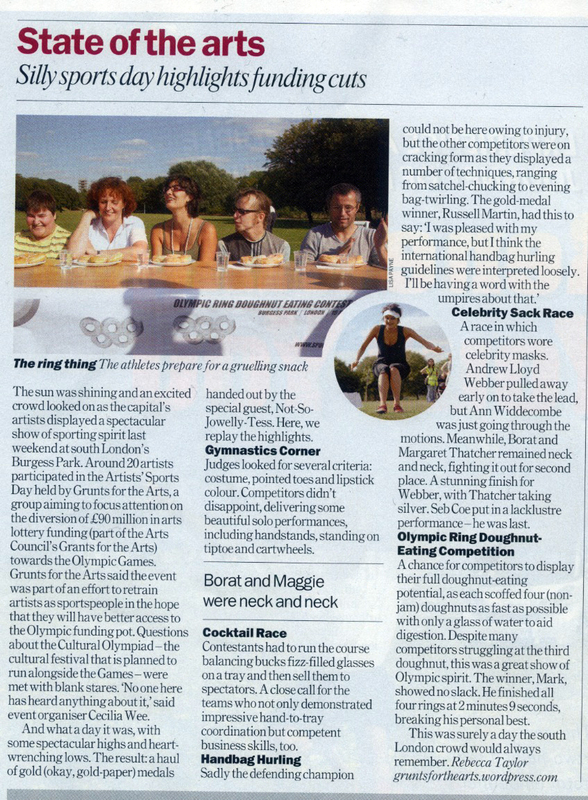 Austrian Daily Die Presse brought us in to a discussion around the pros and cons of the Cultural Olympiad.